Read all about the MP3 Player Project in the October and November 2005 issues of Nuts & Volts Magazine!! In real life it's a little harder than that, but this project will allow you to put together your own MP3 player platform. The software is open source and the hardware is intentionally left generic to allow you to customize it for your needs. This MP3 player was the subject of a two part feature article in the October and November 2005 issues of Nuts & Volts Magazine and, if you don't already have it, we recommend that you visit the nice people at Nuts & Volts and order a reprint of those issues. And as if that wasn't enough, N&V left out the dedication too! Here's what it should have said - Last but never least, thanks to my wife Debee who ported the firmware from the very expensive Keil C51 compiler to the free (!!) SDCC compiler, all the while enduring endless repetitions of Sheryl Crow as I debugged the hardware. There is a Spare Time Gizmos group on Yahoo! specifically for discussing this project and all other Gizmos. Anybody interested is welcome to join, and if you do elect to build the MP3 player we strongly suggest you do. Any updates, errors, offers, or other information concerning this project will be announced there! There are currently no known errors in the Nuts & Volts article, but if any are found we'll describe them here. If we have any tips or hints to help you build your MP3 Player, you'll find them here! chip, push the RESET button and - if nothing screws up - music comes out. Computers don't impress me anymore, but that's still magic to me. 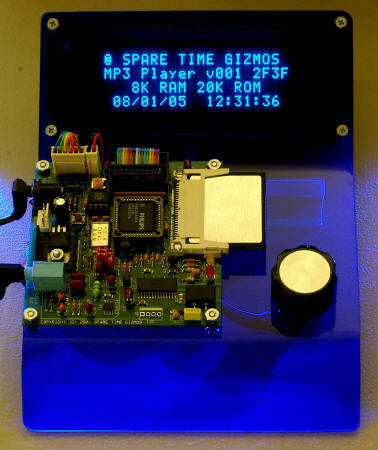 The MP3 Player firmware source code is Copyright 2005 by Spare Time Gizmos and is released under the terms of the GNU General Public License. You're welcome to download it, modify it, and re-distribute it within the terms of that license. If you do something cool with it, let us know - we'd like to include it in our sources! But before you click that DOWNLOAD button, listen to a couple of things, please. First, if you're looking for the source to an MP3 decoder algorithm that runs on an 8 bit micro, forget it. There's no such thing and you haven't been paying attention either - all the MP3 decoding in this project is done by hardware in the form of the STA013 chip. The only thing this firmware knows about the insides of an MP3 file is how to find the ID3 tag, and that isn't very exciting. Second, if you only want to program your player and don't plan to modify the source code, then download the Binaries archive. The hex files in this image were built by the Keil C51 compiler, which generates much smaller, faster and more responsive code than the free SDCC compiler. I guess there has to be some reason why C51 costs $3,000, after all. You can purchase the STA013 and P89C664 chips from DigiKey and the CS4334 from Newark. The exact rotary encoder used in the article is a Grayhill 61C22-01-04-02 which you can purchase from DigiKey for around $20. There are many other cheaper encoders which will undoubtedly work too, but you'll need to decide for yourself which ones are compatible. The current firmware will work with a simple mechanical rotary encoder in addition to the optical version. Digi-Key P/N CT2999 (CTS P/N 288V232R161B2) is a suitable mechanical encoder. The advantage to the mechanical encoder is that it's cheaper - something like $5 vs. $20! The Optrex DMC20481 4x20 LCD display can be purchased new from DigiKey for approximately $30. This model has an LED backlight but is otherwise identical to the one used in the article. You can usually purchase 4x20 LCD displays from other surplus sources for considerably less, but your results may vary. Pretty much any 4 line by 20 column LCD display with a HD44780 controller can be used; other display geometries (for example, 2x40) can be used but will require firmware modifications. The CU20045SCPB-T28A VFD display is commonly sold on eBay and other surplus stores for around $20, however I don't currently know of any source that sells them new. If you find one, write me and tell me. You probably wouldn't want to buy one new, though - they'd cost over $100! Note that the Noritake Itron W5J suffix displays sold by Digikey and others are not the same as the T28A. The W5J displays are actually LCD replacements and might possibly work with the MP3 Player if you connect them to the LCD port and use the LCD firmware. I haven't tried this, though, so no promises. 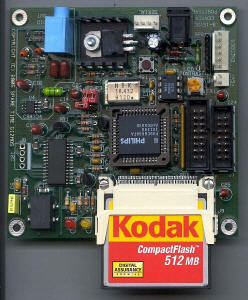 The display interface in the MP3 Player is fairly generic and there are a great number of surplus LCD and VFD displays that could be made to work with minor firmware and/or hardware (e.g. special cables) hacks. If you get one to work, or if you're interested in trying, please join the Yahoo Spare Time Gizmos Group and tell us about it! 21-Oct-2005 - The PC boards are here (!! ), and we should have all outstanding orders shipped by the end of next week. If you do not wish to pay by PayPal, please contact us with your needs and we'll be happy to accept payment by personal check or money order.